4 hours of hiking over approx. 11km. Beijing Hikers regulars: this is the shorter version of this route. We’ll start the walk with a short climb up to a tower on the wall. There are a lot of towers on this stretch – some in good condition, some tumbled down to foundations only. 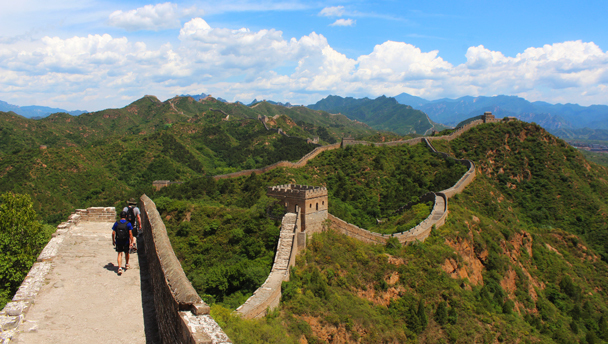 From the first tower we can see the Wall stretching off into the mountains of Beijing’s Miyun District. We’ll be following it the other way towards Jinshanling, and will cross over the border into Hebei Province. The wall in this area is built on ridges, and because there are not many trees on the ridgelines we will have broad views in every direction as we walk up to the tower in the area. That also means that there won’t be much shade, aside from when we pass through towers. Beijing Hikers’ regulars: this is the shorter version of this route.